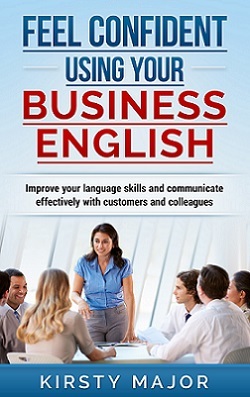 Do you wish that you could feel more confident when speaking English with customers and colleagues? Are you looking for ideas about what you could do in your free time to improve your English? Do you feel nervous when you have to make a telephone call or contribute to meetings in English? Is preparing to present information in English a stressful experience for you? If you can say “yes” to any of these questions, you will find details on a number of free resources that will help you. You can request them by filling in the form at the bottom of this page. This is a five-part bite-sized audio training series. I give five short audio tips, which are all under 10 minutes, and which outline five steps you can take to help with your preparation for giving presentations in English. After you sign up, you will receive five emails (weekdays only). In the email, I give you a link to a page on my site where you can play the audio and read the day’s tip. This is a PDF information sheet that gives you 20 ideas on what you can do in your free time to improve your English. The tips are broken down into sections that focus on reading, writing, speaking and listening skills. On June 11th 2015, I delivered a live webinar called “Feel confident about contributing to meetings in English”. I recorded the presentation and you can watch it too. I share 15 tips on things to consider before and during the meeting so that you can maximise your contribution and feel more confident about speaking English in front of others. This is my factsheet called “10 tips for effective communication on the telephone”. It gives strategies for how to come across well and also points out some things to avoid. This is my factsheet called “How to keep conversations going and avoid awkward silences”. It’s ideal if you have to attend business social functions or if you don’t know what to say when an English-speaking colleague invites you for a coffee. If you would like to receive one of these resources, fill in the below form and I will send them to you. You can have more than one resource, but you need to complete a form for each one.